And what’s a man do to but work out whether it’s true? Lionel, Powderfreak, JoshFox and all the others were talking about the upcoming stormy weather. The finally long awaited storm for the snow starved Northeast mountains. Is it true or will everyone be disappointed again? Looking at a map and trying to figure out where it will hit and where I can go? I can’t choke now on a trip to Vermont. Got to Mad River Glen and everyone was there. Looking to ride in a secret location. Not the smartest thing to do when you’re solo and run into trouble. Trying to get my head quiet from my problems. Still a challenge to get out of the bed right now!!! Click link to access full TR and pics. Bell to bell with a quick late lunch for 12,300 vertical. Sounds like Alta in the 1980's. Patrick enumerated lots of reasons for the big crowd, which would have applied to other places too. I presume at other places (Stowe, Sugarbush, Jay) you get more skiing but the powder gets tracked out faster. Maybe Smuggs? I don't have the time now to research, but I'll be interested to see what JSpin and powderfreak did with this storm. At any rate it's nice to see a TR of Patrick skiing a real mountain this season. Tony Crocker wrote: Bell to bell with a quick late lunch for 12,300 vertical. Sounds like Alta in the 1980's. I missed the first bell at 8:30am. That is the time I finally got off the couch. Where did these people come from? I had never seen so many people at Mad. a) People starved for a storm? b) Valentine’s Day special with $14 for kissing couples? c) Snowday at local schools? d) Ramp skis demo day? e) 50% off tickets for Ski The Point day people? g) Friday before a Holiday weekend? h) Friday before one week school break in Mass? i) All of the above!!! which would have applied to other places too. Reasons b, d and e were exclusive to MRG on that day. 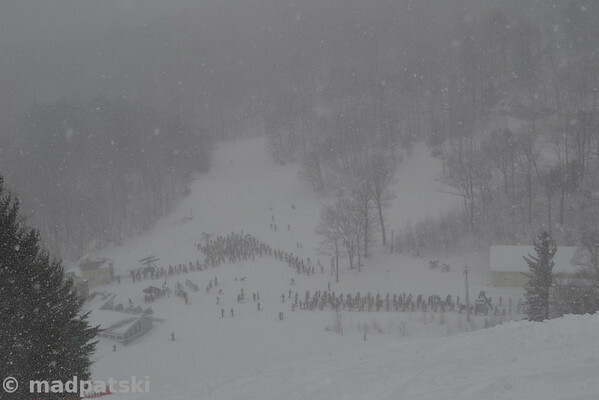 Ski deals and storm can make it a busy day. Smuggs was on choice #2, but as the storm was tracking further south I was thinking that MRG would be close to the bull-eyes. But I was also concern with wind-closure of the Madonna chair. I hadn't look on the forecast wind, but Single is less likely to be affected by wind than the Madonna double.